Need more information about booking Property 2995404 ? Enjoy some quiet time on the lake in South Carolina while watching the geese and ducks swim by. Stationary dock with floater at the end and a boat ramp right on the property. Enjoy a wide lawn for sun bathing or cool off on the large covered front porch. 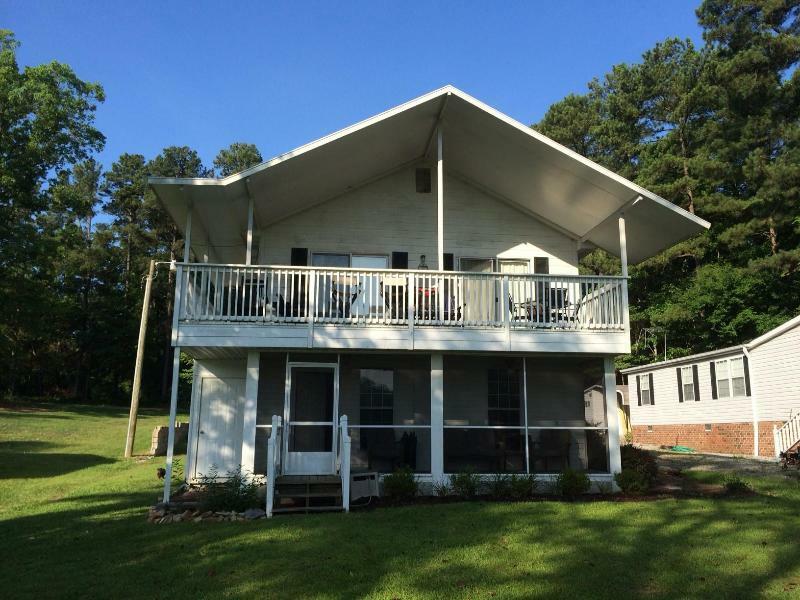 Our house is located in a quiet area of Lake Murray near Prosperity, SC. It has three bedrooms (1 Q bedroom, 1 full bedroom, and one bedroom with set of bunks and one twin with trundle in kids room) and one full bathroom. There is a queen and full futon both in the living room as well. Living room and dining area are decorated in a lake theme and are adjoined. They both open up to the wide porch with 2 sliding glass double doors. Living areas are all upstairs. There is a granite fire pit for roasting marshmallows or just sitting around in the 2 adirondack chairs and enjoying the sounds of nature in the evenings. Great areas for fishing and swimming. Children love this house. Looking out across the water, the view is un-paralleled with no houses directly across with wide channel. Great cove for skiing! 4)	Garbage should be bagged and placed in containers. 5)	At check-out, used linens should be placed in laundry area. A wonderful place on the lake. Many nice features and a wonderful fire pit. Great dock area and lots of seating to enjoy the view. Response from the owner Thank you for your kind review. Glad you enjoyed the stay. We went down to the lake for a weekend of fishing and to spend time with our children and grandchild. We took our Bass Boat with us so it was nice to have a boat ramp at the house. We enjoyed 3 days of fishing and also went to the nearby Riverbanks Zoo! My Grandson had a blast! We loved this rental had a beautiful view of the lake, had a new dock, new ramp, sandy beach area and fire pit. The owners of the house thought of everything! The house has kayaks, life jackets, floats, chairs very accommodating. During our stay at the house it was very clean, the beds slept great and had new sheets and pillows. The Grandson loved the Kids room and slept good on the bunk beds. Another thing I was impressed with was great water pressure in the Shower! We grilled out so it was nice that there is a Bilo 15 min away. I would recommend this lake house. The Halls were super nice and made sure we had everything we needed. We enjoyed a great vacation with our children. During the day we fished, swam, and had a picnic. During the evening we had a fire in the fire pit and roasted marshmallows. There are many places to rent a boat on Lake Murray, so we rented a boat for the day and enjoyed tubing and skiing. You will not believe how many different types of birds you will see here as well as the deer that visit at night. This is the perfect place for a quiet relaxing family vacation. The kids stayed in the room with bunk beds where they watched Dvds. The road is quiet and the children brought their bikes, so we walked/biked around the neighborhood. Be sure to bring your bathing suits, a good book to read, sunscreen, and the ingredients to make smores! You can get in touch with Meredith (the owner) through the contact form on this page. Send Meredith (the owner) an email through the contact form on this page. Alternatively, if there’s a phone number on this page, you can call them. How do I contact Meredith (the owner)? If you’ve already booked, go to Manage your booking to view Meredith the owner's contact details or send them a message. Or send Meredith (the owner) an inquiry through the Contact the owner/manager form if you’d like a quote or more info first. When you pay online through the Ready to book? form, a booking request is sent to Meredith (the owner). You’ll find out within 24 hours whether they’ve accepted - no money will leave your account before then. You can also request a quote from Meredith (the owner) through the contact form. The owner will email you the total cost for your dates and a link to book and pay online. Use the Ready to book? form to pay provisionally online. You can pay by credit/debit card or PayPal. Meredith (the owner) will have 24 hours to accept the booking and no money will leave your account before then. Why can't I call Meredith (the owner) before booking? You’ll need to contact Meredith (the owner) to do this. Send them a message in Manage your booking or through the contact form on this page. You can request to change the dates or number of people on your booking via the Manage your booking page. To change your dates use the Edit booking button. If you need to change the number of guests staying then send Meredith (the owner) a message. If Meredith (the owner) agrees, they’ll send you a revised quote outlining the changes. You can review and accept/decline this from the Manage your booking page. You’ll have 48 hours to take action before the revised quote expires. Estimated price per night based on a weekly stay. Owner fees of $75.00 per stay may apply. Enter your dates to see the total cost.